The cover story, written by the far-left Jonathan Chait, is titled “Corruption, Not Russia, Is Trump’s Greatest Political Liability”. Judging by the excerpt in the Hill, Chait’s primary concern — as the president’s approval number hits 50 percent on Monday (with only 49 percent disapproval) — is that the media’s unrelenting attacks against Trump are only tripping over each other; therefore, nothing sticks; nothing is focused on. Not only has Trump made no effort to raise ethical standards but he and his administration have flamboyantly violated the existing guidelines. Lobbyists are seeded in every agency, “regulating” their former employers and designing rules that favor bosses over employees and business owners over consumers. Chait’s cover story is obviously lacking in specifics, anything close to a smoking gun to back his “corruption” headline, and sounds more like yet another overheated, sky-is-falling nothingburger served up by a media that are still unable, even 16 months in, to cope with losing the 2016 election. Because Chait’s story is so underwhelming, so unable to grab anyone’s attention on its own merit, the left-wing New York magazine was apparently forced to spice things up with a provocatively nasty cover photo. 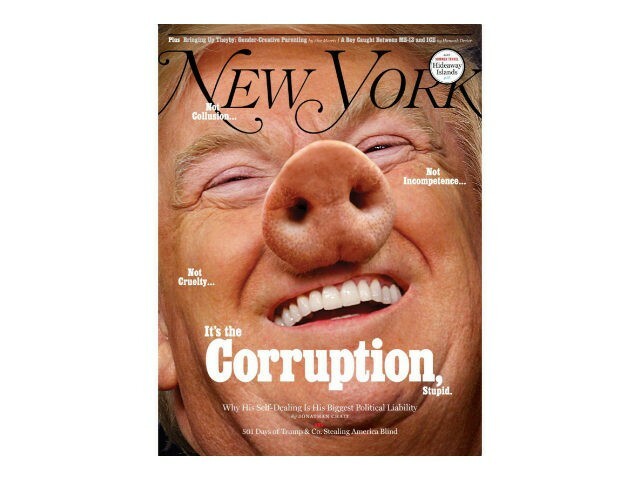 The Trump-as-pig cover, although a new low for a mainstream media outlet desperate to violate its own precious news in pursuit of Trump’s scalp, is also hypocritical. Inside the magazine, Chait whines about the hurricane of media assaults on Trump obscuring one another. The Trump-as-pig photo promoting his story, though, only adds to that problem, is just more noise coming from the media’s Hate Machine, and more proof our media are so deranged and blind in their hatred that absolutely nothing they report will or should ever be taken seriously.